Metabolic syndrome (MetS) is a combination of medical disorders, including abnormalities in insulin, glucose and lipid metabolism, hypertension and abdominal obesity, causing several metabolic complications. Metabolomics has been increasingly employed for investigating obesity and obesity-related diseases in recent years. Because metabolome is dependent on the physiological, environmental, and genetic status of an organism, metabolomics can help to understand the biochemical networks that underlie metabolic homeostasis in obesity. The ongoing development of mass spectrometry (MS) and chromatography has enabled more comprehensive coverage of the metabolome. Many obesity-related metabolites have already been identified by metabolomics and demonstrated to be disturbed significantly in both animal models and in humans. 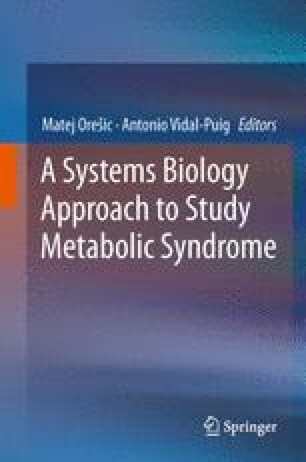 This chapter describes the methodology used in metabolomics and summarizes the current knowledge about the effect of obesity and MetS on metabolic pathways.